Ten years ago this month I started graduate school, and I was determined not to wait in line at the computer center or rely on the kindness of friends who had their own computers. I needed my own machine. I had used PCs at work, but a friend let me use his Mac Plus to write my grad school applications. 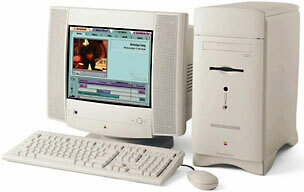 Having seen my options, I knew I wanted a Mac by the time I got to school. My first trip to the campus computer store was embarrassing. How much RAM did I want? How big a hard drive did I need? Internal or external? What processor speed? Double-density floppy drives? I had no idea what the guy was talking about, and he had no intention of explaining, so I left dejected and confused. Then someone suggested I look into getting a used computer. I found an ad for a dual-floppy SE with an external 30 MB drive and 2.5 MB of memory, and I called the guy up. As it turned out, he had just finished the graduate program I was starting and was kind enough to explain some of the ins and outs of computers to me. His sales pitch was convincing as well: The dual floppies meant that if the hard drive went down, you could run the system on one and your programs on the other. (Remember when you could fit a whole operating system on a floppy?) Plus, because the hard drive was external, it could go to the shop while I kept working. He also said he’d throw in a 2400 bps modem. I had no idea what that meant, but it sounded good. I bought it. He helped me pack it in my car, told me to call him with any questions (I only had to once), and off I went. The effect was immediate. Every moment not spent in class (or in a bar) was spent in front of my SE. I rummaged through the System Folder, played games, drew pictures, wrote reports, edited icons, made spreadsheets, and tweaked every setting I could find. I ate breakfast, lunch, and dinner in front of it. 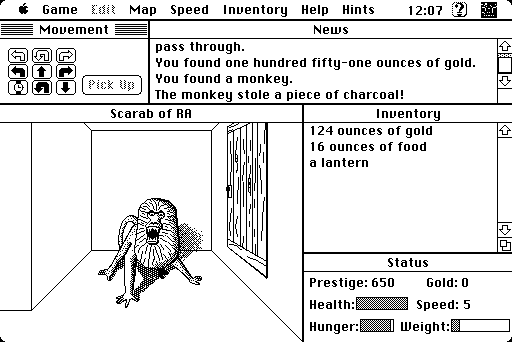 I would stay up until dawn playing Crystal Quest, Defender, ShufflePuck Café, Scarab of Ra, Risk, and Strategic Conquest. I dragged it out into the living room to connect it to the phone line to get on bulletin boards and send email on GEnie. Yes, I loved that machine. But, as is often the case, you never know what a good thing you have. I frequently stopped in computer stores to check out the new models, and color was the wave of the future. In 1992, when the LC II came out, I picked up a marked-down LC, which gave me color, more memory, and a larger hard drive. The SE went to an excited young kid whose dad was buying him his first computer. I hated to see it go, but I felt it was going to a good home. When my first job out of grad school took a turn for the better in 1994, I sold the LC and replaced it with a Quadra 610 I found on the sale table at Computer City. My boss bought me a DOS card so I could work at home. The 610 was joined in 1995 by a PowerBook 520c I bought on sale for my live-in girlfriend (now wife) for our anniversary. My second job out of school came with an annual bonus, so I sold the 610 in 1996 and replaced it with a Performa 6400, the first computer I paid full price for. I later upgraded the 6400 with a Vimage G3 card and replaced the performance-dragging GeoPort modem with an external 56k modem. After some discussion about color with my wife (tangerine for the Baltimore Orioles, her team, or blueberry for the Seattle Mariners, my team), a blueberry iBook joined the 6400 and the 520c last November. I compromised by putting an Orioles Kaleidoscope scheme on the 520c. In March, a G4 tower became the top dog of the group and paved the way for digital video. When my company asked me to go to Japan for three months earlier this year, the iBook went along with us. We updated our website with pictures from Japan, played games, listened to US baseball over the Internet, and emailed like crazy. My wife used it to write and file stories for the newspaper she works for and took it to cafés to work on her writing. Because the Mac OS comes with the Japanese language kit and I read Japanese, we could get email from our Japanese friends and surf Japanese sites. I had to take my Compaq work laptop along as well, and it was nothing but trouble. The screen went out, it locked up, its square edges cut into my wrists, and Japanese just looks like strings of random characters in Microsoft Mail. I’ve found that computers can win my adoration by doing more than I expect– or my contempt by doing less than I expect. After ten years with Macs, I still have fond memories of the SE’s little black and white screen and boxy form factor, because it did so much more than I imagined it could do. 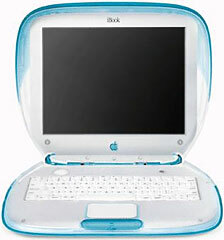 The iBook’s wireless networking and ability to handle every task we threw at it while in Japan also won my respect. I’ve bonded with those two machines more than any of the others I’ve owned. Needless to say, my relationship with the Compaq is more adversarial. While I like having a host of machines around, come Christmas the Performa is probably going to go to some friends and their kids – hopefully some future Mac converts — to free up some space and some electrical outlets. 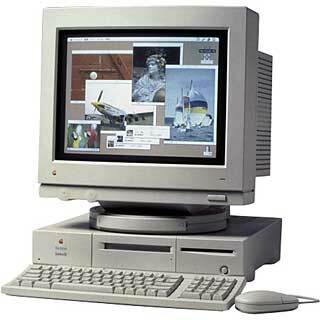 I’m going to make a renovation project out the 520c, which is a Low End Mac “Good Buy”. I still miss my SE. If I get a chance, I’m going to pick one up somewhere. For some reason I kept all my old disks, even though my new machines don’t even have floppy drives and the Mac OS hasn’t tolerated those old games in years. Sometime I’ll spend another long night hunched over an SE getting reacquainted with an old friend.